Math Blaster Ages 7-9 Game Review - Download and Play Free Version! Get your 7-9 year old to learn a variety of Math skills and have a great time doing it! Math is incorporated in a fun and educational manner. Help icon teaches you the basics of addition, subtraction, multiplication, and division. Comic book and Super Hero themes are a great addition. Gameplay and buttons can be finicky. Directions are not explained well. Programming the bugs to destroy Dr. Zero is too difficult. Save the Galaxy, One Math Problem at a Time! Oh no! In Math Blaster Ages 7-9, the sinister Dr. Zero has infested the Omega Supercomputer with bugs, and it's up to you and your children to help the Blaster Team capture and reprogram the bugs through math-based mini games! Part of the award-winning Math Blaster series of kid's software, Math Blaster Ages 7-9 develops three core areas of early learning: fundamental math skills, logic and problem solving, and math confidence. The game's exciting and energetic approach to learning interests kids (and parents) for hours on end. Math Blaster Ages 7-9 consists of four unique activities: Bug Hunt, Circuit Quest, Domino Bridge, and Musical Math. While each one focuses on different specific skills, they all reinforce each other to provide comprehensive growth in math ability for kids grades 2 to 4. The activities present more than 50 distinct skill areas, including over 350 lessons and 1000 problems. Multiplication, division, fractions, decimals, graphs, geometry, and measurement are only a few of the skills your children build on! In addition, each activity has five levels, so kids need only know the simplest basics to start learning...and having fun! Although Math Blaster Ages 7-9 is so easy to use that kids will quickly learn to navigate the game, parents will naturally want to follow their children's growth. It's made easy with the built-in Progress Tracker, as well as the scoring system which enables comparisons with earlier scores. Beyond the main game, the Blaster's Watch area provides printable puzzles and extra number and geometry exercises. With Math Blaster Ages 7-9, kids see learning and practicing math not as a chore to be avoided, but as an adventure to be enjoyed! The Full Version of Math Blaster Ages 7-9 is an investment in your child's education. You can feel great knowing your child is playing on the computer and actually learning some valuable skills and advancing their education! Math Blaster is an educational adventure game that has you collecting enemy bugs in an effort to regain control of the Omega Supercomputer that Dr. Zero has overtaken. Through solving math problems and completing various mini-games, you can collect the bugs, eventually reprogramming them to do your bidding against the evil doctor. In this adventure, accompany Math Blaster, CC, and their lovable dog as they add numbers to divide the evil empire Dr. Zero has created. 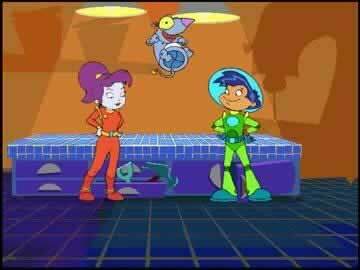 Though on the surface your child might not realize that he or she is learning, Math Blaster 7-9 is a great educational adventure game. In this game your objective is to collect and reprogram bugs which have been scattered throughout the game. Through successfully completing the mini-games, you earn bugs that can then be used against Dr. Zero, regaining control of the Omega Supercomputer. There are four unique bug-catching games that provide you with varying gameplay, while remaining educational. The first of the modes is Bug Hunt. In this mode you collect bugs whose product lies within the desired range. To expand, all the bugs have a math equation on their backs. At the top of the screen you are given a range of numbers (2-9 for example). To complete the level you must capture bugs that fit into the desired range of products. For example if the range is from 2-9, you could collect a bug that has the equation 15-8 because the answer to this is 7. Since 7 lies between 2 and nine this bug would be eligible for capture. Though the description is hard to get across, the game is easy to figure out once you start playing. 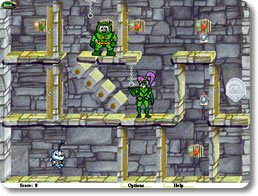 Circuit Quest is another of the games. This is less focused on math and more concerned about logical thinking and working through problems. In this game your heroes are trapped in a room full of circuits, and through careful planning and maneuverings you must help them out. Once they get through the labyrinth you are faced with a few simple math problems you must solve, before being awarded the mutant bugs. Domino Bridge is another of the games. In this you must help the main characters cross a bridge that has been destroyed by the evil Dr. Zero. Through connecting dominoes, which incorporate math problems (rather than writing 6, the pieces would show 2x3. Something math related), you rebuild the bridge and earn bugs. This game is fun, but is the most difficult to get working. There seem to be some flaws in the game that make solving the puzzles difficult to do, even if you know exactly what you want to connect. The final of the games is called Musical Math. This game helps with reading comprehension as well figuring out shapes and information on polygons. In Musical Math you place different polygons on a sheet of music, completing the piece, making music, and collecting bugs. This geometry based game is interactive and provides useful information on shapes you or your child might be unfamiliar with, like rhombuses and trapezoids. Musical Math is fun, yet can also sometimes be finicky with button clicking and responsiveness. As far as flaws are concerned this game lacks in a few areas. The gameplay is not as smooth as it could be and sometimes the buttons are unresponsive. This is frustrating but is typically corrected by restarting the level or retreating back to the game menu. Also, in relation to gameplay, sometimes the directions are not as beneficial as the could be and leave information left unanswered. This is usually corrected after a few moments of trial and error, however, it can be frustrating. Another problem with the game related to playing is with defeating Dr. Zero. It is hard to get the bugs to work for you and manipulating them in an attempt to defeat the evil Dr. is difficult and seemingly impossible. This part of the game alone could take hours to accomplish and is too hard. 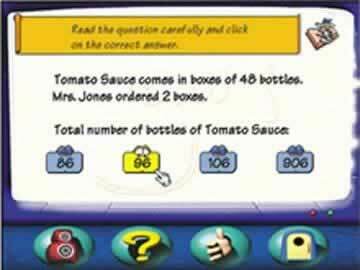 On the whole, Math Blaster is a great educational game that will keep you or your child interested in learning. Yes, there are a few flaws with gameplay and button responsiveness, however, none of these flaws are too serious. Learning is highly stressed and the skills your child will pick up after playing are far worth the few errors he or she might encounter when playing. This game is great for children in or around the second grade and can be adjusted in difficulty, making it playable by older children as well. If you like math, collecting mutant bugs, or want to improve your overall knowledge of shapes and numbers this game is a great choice for you.